It is THAT time of the semester. We are ready for a break – yet everything (for the Man) is due. The girls are excited about a Thanksgiving trip so I have had to really keep them directed. And I’m not really directed myself. We keep on keeping on. Enjoying the journey! 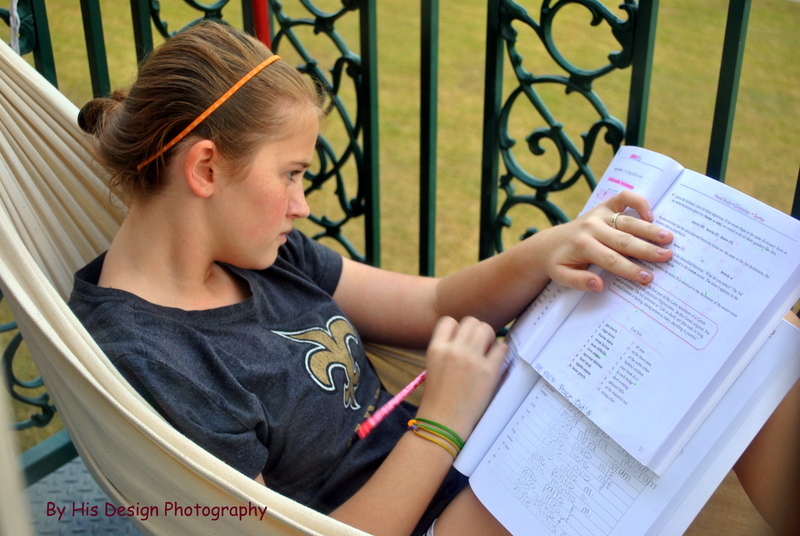 In our homeschool this week…. We have had a full week. We seem to be overloaded with extracurricular classes and activities, but the girls love everything so I do not want to stop any learning that they find fun. Our co-op is such a blessing! Monday – In addition to the subjects we do at home, each girl had P.E. and choir. Lil Sis had violin. She is learning to play The First Noel for the Christmas program. Big Sis had piano. 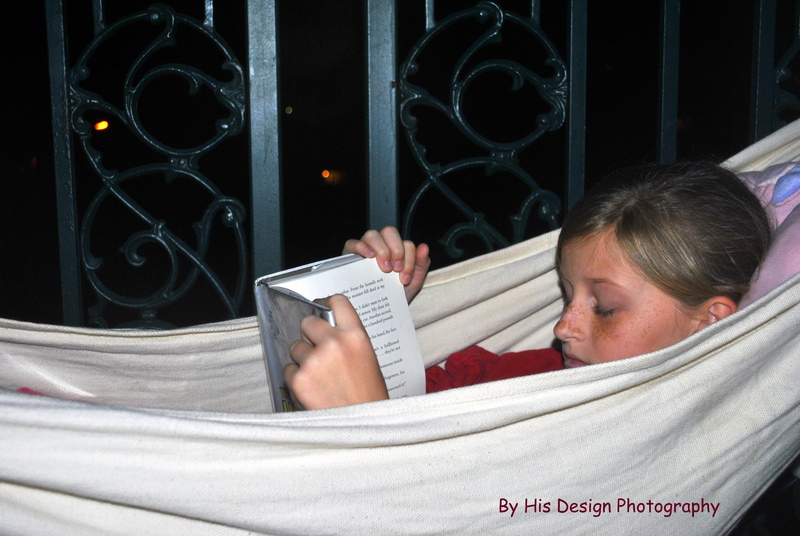 Lil Sis has found a new favorite reading place – her hammock on the balcony. Tuesday– Big Sis and I had a “math date.” Math is going well for her. We are still thinking about different curriculum, but I am pleased with her understanding. Lil Sis had her drama class. She was practicing her lines in the morning, and I realized that she knows her lines…and everyone elses. Big Sis, Middle Sis, and I had an “Editor in Chief date.” We are using this to reinforce all those boring grammar rules! I was a little discouraged after the first few lessons. But we continued working on it, and they are really starting to be able to recognize the errors. Great for critical thinking skills. Wednesday – Co-op day!! In science lab, we continued our study on the Wonder of Water. Thursday – Field trip day!! It started a little rough, because I lost the group that was following me. Oops! 🙂 I had built in a little extra time in cause of traffic so we were okay. We went to the Louisiana Supreme Court building. Did you know that there are only four states that have supreme courts that are NOT located in the state capital? Louisiana, Delaware, Alaska, and California. We could not take our weapons or our cameras into the building. But we did have a photographer that followed us around. As soon as I get the picture CD from him, I will do a virtual field trip. 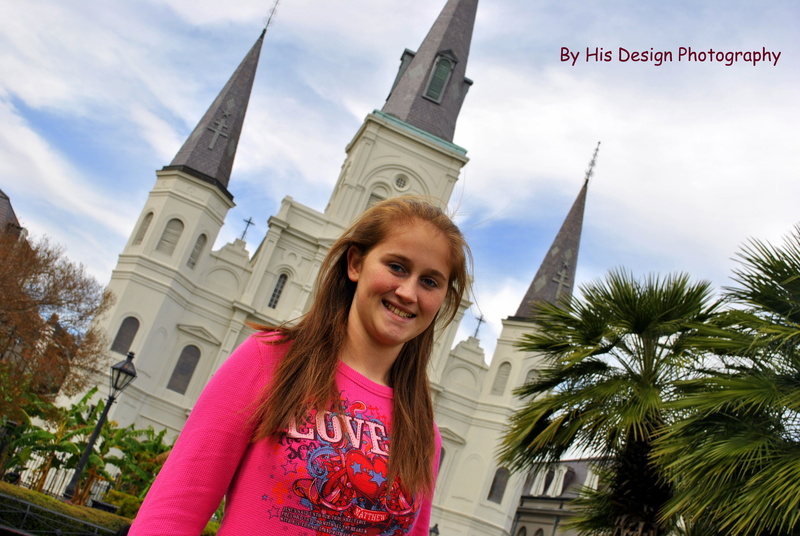 Although I thought it was too cold, the girls talked me into a picnic in Jackson Square…. then a walk down Royal Street. We always enjoy looking that the local art and listening to the street musicians. 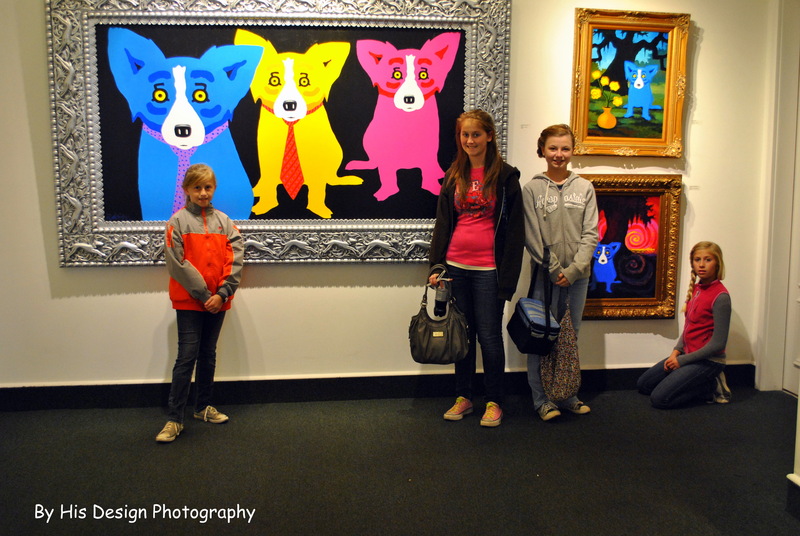 We stopped by George Rodriquez’s Studio to see some of his Blue Dog paintings. I was so blessed by our co-op meeting on Thursday night. Our kids were invited to play sports at a local Christian school. The girls are excited about softball. But the best thing was praying over our children together. There is nothing more precious than moms praying for their children. Middle Sis had her drama class. She doesn’t want any help with her lines because she wants it to be a surprise. Christmas presents!!!! The girls and I are making some really cute Christmas presents from old Baptist hymnals that the church was going to get rid of. We decided to recycle them. I will post some pics after Christmas….I don’t want to spoil the surprise for anyone. Chris Tomlin’s How Great is Our God (World Edition). I love it!!!!! I love hearing different tribes, tongues, and nations singing to the Lord. I have created the best recipe for Cajun Potato Salad (according to the Man). I am not much of a cook so this is a great break through for me 🙂 It is really just regular potato salad with a pinch (or two…or ten) of Tony Chachere’s Creole Seasoning. So many things!!!! Working on my 1000 gifts list and 30 Days of Thanksgiving has really opened my eyes and my heart to all that I have to be grateful for. We have some wonderful friends in Atlanta who had a family emergency this week. Her dad had to have heart surgery. We are praying for his healing. 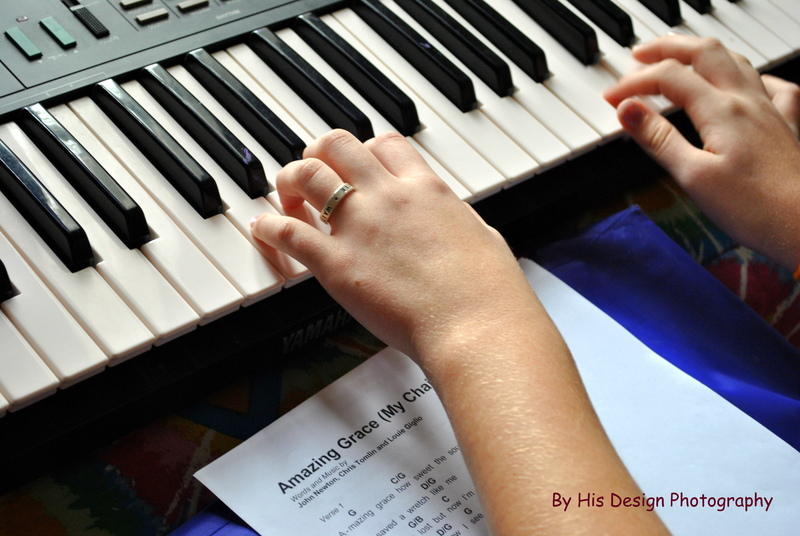 This entry was posted in Field Trip, homeschooling, Weekly Wrap Up and tagged homeschool. Bookmark the permalink. 3 Responses to WeEkLy WrAp Up!! Can’t wait to see the pictures from the field trip. Keeleigh apparently really enjoyed it. She came in telling me everything and reading through her packet. Thanks again for letting her tag along with you guys! I have found that doing the “Weekly Wrap-up” really makes me think about everything that we have done during the week. Some weeks I have wondered if any “schooling” was done. But by doing this, I have realized all the great learning that is happening. And I love linking with other homeschoolers (around the country and the world) and seeing what they are doing. I have gotta some great ideas from them!! I agree with what you said above – that Weekly Wrap-Up is a great tool for helping us to appreciate our lives and recognize the success! My husband has said that before, too, when he is reading my blog, like, wow, you really did a lot this week. When maybe I was thinking, wah, wah, my life is boring. And it really is hard to juggle co-op with everything I want to do with homeschooling. And my husband will recommend cutting something out, but I don’t know what that would be! I love their extracurricular activities, too.